Commandant Gen. Jim Amos touched on many topics during a breakfast with media in Washington on Wednesday, yielding headlines that include an update on the state of affairs in Afghanistan and an acknowledgment that the service will likely draw down to 174,000 Marines if drastic federally mandated budget cuts stay in place. Not to be overlooked, however, is the commandant’s characterization of his new unit, Special Purpose Marine Air Ground Task Force-Crisis Response. The 550-strong force deployed in April, providing Gen. David Rodriguez, commander of U.S. Africa Command, a designated unit equipped to response to emergencies that erupt in volatile northern Africa. The commandant visited the force earlier this month during a trip abroad to U.S. Central Command, Amos said Wednesday morning. The unit is now split between Morón Air Base in Spain and Naval Air Station Sigonella in Italy, putting elements of it as close to northern Africa as possible without being on the ground there. The force initially was put in Spain, but staged in Sigonella in May when the security situation in Libya took a turn for the worst. The commandant said about 87 Marines were eventually sent to Libya to reinforce the embassy in Tripoli, which he visited June 16. The force has six MV-22B Ospreys and two KC-130J tanker planes, allowing it to move Marines around the region quickly when necessary. Amos said Wednesday it is built around a company of reconnaissance Marines, conflicting with previous statements saying a company of conventional infantry Marines from Camp Lejeune, N.C. had deployed. Marine Corps headquarters has repeatedly declined to identify which company of Marines it is. Amos said when he visited the force, it was on an alert status in which they had to be wheels up to respond to any crisis within six hours. The force also have been on an even more heightened alert status in which they would have to leave within an hour if necessary, the commandant said. 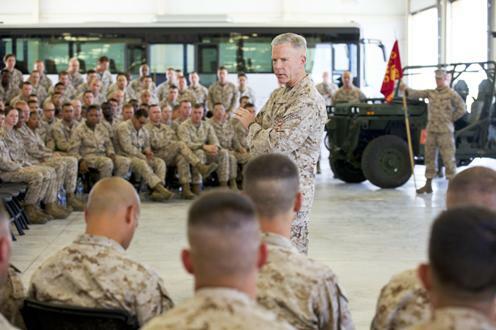 The commandant said that when he and now-retired Gen. Carter Ham, the last AFRICOM commander, discussed establishing the crisis response force, there wasn’t enough room for all of it at Sigonella. Spain was willing to provide room, “but it’s a little bit malpositioned” to respond to crises in Africa, Amos said. “Spain has welcomed us, and they have been wonderful hosts. But, what we have done now is we have taken a slice of it… and moved it to Sigonella,” Amos said. Elements of the crisis-response force are rotated between Spain and Italy because the piece in Sigonella is on heightened alert status more frequently.